Halloween is right around the corner! 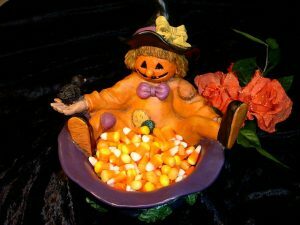 Do you know how much candy is sold on Halloween and what candy is sold the most? Snickers are the most widely sold candy and the US alone spends approximately 2 billion dollars on candy during the Halloween season – nearly 90 million pounds of “Candy Corn” alone is sold each year — (If you laid each piece end-to-end, you could circle the moon 20 times.) — These statistics are followed by 65 million pounds of candy being sold during the week leading up to Easter and only 48 million pounds during Valentine’s week. The average household spends approximately $44 on candy during the Halloween season – that’s a lot of candy! However, America may be making some changes – more money was spent on costumes during the 2012 season than on candy. To break it down even further, different candy is sought out from different states… New York searches most for kosher candy, Wisconsin looks most for gummy worms, Colorado for organic candy, Oregon for gluten free candy, and Kentucky for sugar free candy. With all of these large numbers, it makes Halloween the 8th biggest holiday in terms of sales. Can you guess the others? The No. 1 slot should be obvious: Christmas and other winter holidays reign supreme at $586 billion, according to the National Retail Federation. The runners-ups include back-to-school shopping, Valentine’s Day, Easter, Mother’s Day, Father’s Day, the Super Bowl, and then Halloween. Whatever you do this season, remember to be safe, have children wear bright or reflective clothing, take a flashlight and monitor the candy your children eat. Hope you have a “bootiful” Halloween!